song – Len Bilén's blog, a blog about faith, politics and the environment. Invitation to Bohuslän, as sung at the funeral service of Gertie Bilén. July 27, 2018 was the funeral service of my mother, Gertie Bilén. She was almost 99 year when she died July 4. She had a rich and fulfilling life, so rather than the normal sorrow it was more of a celebration, we do not sorrow as those who have no hope. My niece and brother performed my mother’s favorite song. “Invitation to Bohuslän” It is in Swedish but describes her life since she knew many of the places and people in the song. Enjoy! Posted on August 2, 2018 December 1, 2018 Categories life, song, song, testimonyTags Bohuslän, Heligeandskyrkan i Lund, Inbjudsn till Bohuslän, Invitation to Bohuslän, SwedenLeave a comment on Invitation to Bohuslän, as sung at the funeral service of Gertie Bilén. V-E day 1945. A childhood memory from Sweden. V – E day 1945. Ah, yes, I remember it well. In 1944 my father bought a shortwave radio to listen to news from the the Finnish war. He sat up at night, at exactly kaksi, kymmenta kaksi (22:00) there was a ten minute condensation of the war news. Sweden had taken in more than 70,000 children from Finland to keep them from being ravished by the war. In addition we had some Estonian children and a few Jews in the school where my father taught. I was not yet four years old, but I was fascinated by the news, asking my father what it all meant. Then came the spring of 1945, and the family sat around the radio to listen to the noon news. They told that Denmark had been liberated the day before, and that the German army had surrendered. The day was May 5. So I asked my father what that all meant. My mother interrupted and smiled broadly “That means, we are going to have peace.” Being not quite four yet, I remember answering “But what are they going tell us on the news then?” Up till then, all I have heard on the news was war news. They assured me that from now on there was only going to be good news on the radio. We all hugged and sang a song, I don’t remember which one, but we often sang “Blott en dag” (Day by day). This has become our family song, and we have sung it as good night prayer for years with both our children and grand children. Posted on May 8, 2017 May 8, 2017 Categories Christian, faith, song, testimonyTags Day by day, Finland, Finnish war, Sweden, V-E day, WWIILeave a comment on V-E day 1945. A childhood memory from Sweden. 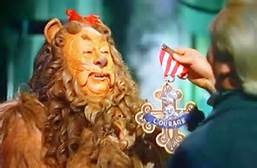 Obama, like the Lion in Wizard of Oz gets Medal of Courage, gets medal of Distinguished Public Service. The 100th and final verse in the Obama song. 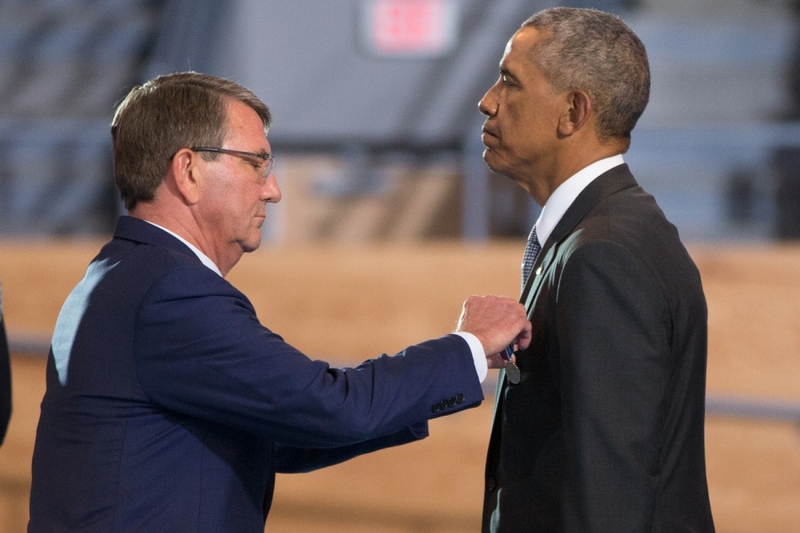 On Jan 4, 2017 soon exiting President Obama added another prestigious medal to his Nobel Prize collection when he had Defense Secretary Ash Carter award him the Department of Defense Medal for Distinguished Public Service. Secretary Carter awarded his boss the medal during the Armed Forces Full Honor Farewell Review for the President held at Conmy Hall, Joint Base Myer-Henderson Hall in Virginia. The ceremony was sparsely attended, only the required crew of brass bothered to show up. Like when the Wizard of Oz gave the Medal of Courage to the Lion lacking courage. It was too much for one member of the Obama honor guard, so he passed out during the speeches. soon to be put on the shelf. My judgment – or lack speaks for itself. Posted on January 5, 2017 January 5, 2017 Categories Obama, politics, songTags Ash Carter, Distinguished Public Service Medal, impeachment, Medal of Courage, Obama, politics, song, Wizard of OzLeave a comment on Obama, like the Lion in Wizard of Oz gets Medal of Courage, gets medal of Distinguished Public Service. The 100th and final verse in the Obama song. One more verse to the Hillary Nursery rhyme: Jail for Hillary? “Because you’d be in jail,” Trump retorted. Hillary, Hillary, will you be in jail? Posted on October 10, 2016 October 10, 2016 Categories campaign, Clinton, Politics, songTags Donald Trump, Hillary Clinton, Jail, nursery rhyme, songLeave a comment on One more verse to the Hillary Nursery rhyme: Jail for Hillary? Verse 98 of the Obama impeachment song: The eulogy of whom? President Barack Obama in Israel for the funeral of former Israeli president Shimon Peres pointed out that both he and Peres had “unlikely” lives. “I think our friendship was rooted in the fact that I could somehow see myself in his story, and maybe he could see himself in mine,” he said. the person I talked about was me. Posted on September 30, 2016 September 30, 2016 Categories eligibility, Obama, Politics, songTags eulogy, impeachment, Obama, politics, Shimon Peres, songLeave a comment on Verse 98 of the Obama impeachment song: The eulogy of whom? One more verse to the Hillary Nursery rhyme: Hillary Clinton cross eyed. Hillary, Hillary, what’s with your eyes? Posted on September 24, 2016 Categories campaign, Clinton, songTags cross eyed, Hillary Clinton, nursery rhyme, songLeave a comment on One more verse to the Hillary Nursery rhyme: Hillary Clinton cross eyed.